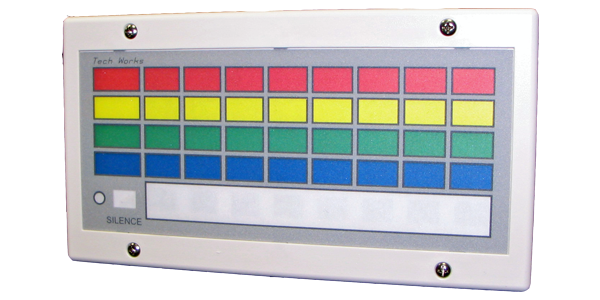 The Tech Works CC-AN-84-T is an 8 Column, 4 Row, Light, Intelligent Annunciator panel. Made of white ABS plastic with a removable faceplate, each unit can be custom labeled to identify staff or locations. An integral tone sounds to draw attention to Emergency Calls. A big window allows for large labels of call points. Labels are back-lit so the call point lights up when a station is active. This is a digital communication device using Intelligent Control Modules for call point monitoring. Each CC-AN-84-T corresponds to eight CC-RS-4 Room Status or CC-DL-44 Dome Light by simply setting matching addresses.. Each column represents an exam room status. To display the same information in multiple locations, simply locate the annunciators where desired and set the addresses the same. The tone can be permanently disabled via a jumper.